Vichy in France	Vichy, the verdant lungs of the Auvergne. 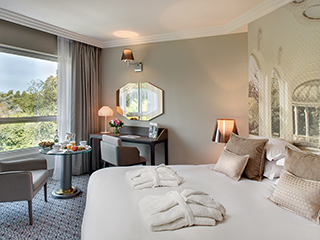 For a romantic weekend, with the family, or a business trip, the Town of Vichy brings together all the positives of an ideal destination. The town provides numerous cultural and artistic activities, for example the casino, the opera house, concerts, exhibitions and shows. Added to which are remarkable sporting facilities for your leisure time, with golf, tennis, horse riding, rowing, and water sports. It is also an excellent base to discover the magnificent region of the Auvergne! With the thermal spas and their related activities, the Napoleon III parks, the sports and cultural resources, Vichy is a good place to live, work and relax. Covered walkways, streets full of shops, promenades along the peaceful River Allier, take advantage of a peaceful good lifestyle. A real green site, Vichy has 140 hectares of beautiful parks with rare and exotic trees. Remarkable 100 year old trees stretching up before your eyes... 2,000 years of spa water treatments, have left the Town of Vichy with an innate imprint of traditional skills and hosts of people coming for thermal spa treatments to improve their lifestyle. The capital of fitness, health and well-being; you should try out one of the town's three thermal spa centres. Naturally and historically linked to thermal spa treatments, this charming thermal spa town has the reputation of being the « Queen of thermal spa towns ». Relax and wind down in this charming place. Taste the good life, with covered walkways around the Parc des Sources gardens in the town centre, streets full of shops and pleasant walks next to the River Allier. Stroll through the beautiful parks and gardens, or even around the vast dammed river lake with footpaths and mature trees.